This remarkable Holy Face of Jesus glass bead chaplet is like no other. 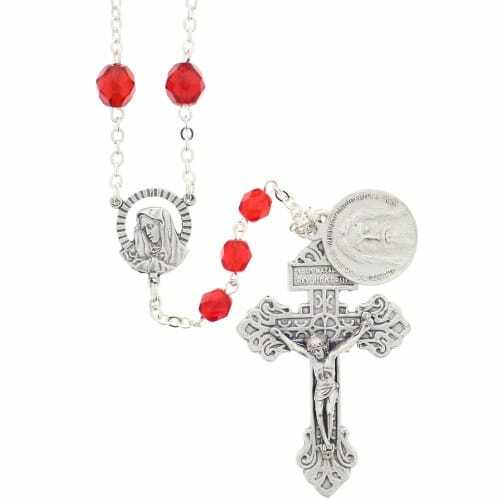 Rich, vibrant red beads host a uniquely designed Shroud of Turin medal that unites beautifully with the elaborately detailed crucifix of the Sacred Heart. Our Lady of Sorrows centerpiece unites the chaplet for a fine devotional that anyone will cherish. A gift of prayer that will leave a lasting impression! Beautiful and so well made, love it!!! Very happy with Chaplet and thank you for the extra medal of the Holy Face that is attached to the Chaplet. I am very pleased with the rosary and was able to print the prayer to say on it. I love your company. I am currently reading the book, The Golden Arrow and will do the chaplet during my Adoration Hour at our church. At first sight this chaplet looks like a rosary, with five sets of bead, a crucifix and center medal. The 33 beads honoring Jesus' life are comfortable in the hand and are distinguishable from the larger beads. The Holy Face of Jesus medal is a little small to gaze upon; a larger image would be more easy for meditation.